lol, 06 Dec 2012when someone pulls the note 2 from ur pocket and u stil be thinking that its in ur pocket ... ... moreFits in ny pocket. IM no giant. IM no pee wee Herman either.. 6ft normal man and i love the lumia. check out all the reviews. AnonD-77737, 07 Dec 2012worst audio and loudspeaker o/p. Sorry nokia, i din't expect this from you or ur 920.Actually one of the best to be honest. I don't enjoy sloppy workmanship. I have lumia 920. And i can say 100% hand on heart. Audio sound all round is beautiful. . Don't begrudge yourself this divine handset on hearsay from this forum alone. Check other reviews ( you will be surprised). worst audio and loudspeaker o/p. Sorry nokia, i din't expect this from you or ur 920. AnonD-78156, 07 Dec 2012Microsoft is catching up with iOS? on what? it seems a lot more advanced to metrue that .... adding sd card support and NFC will definitely make a good addition to features list. Apple definitely is missing NFC and the customers have to wait for one more yr to get that feature. Still one point notification center is missing in WP8 ..the most wanted feature right now. they have promised to give it as update soon ... then it makes wp8 stronger contender. AnonD-78156, 07 Dec 2012Microsoft is catching up with iOS? on what? it seems a lot more advanced to meI agree, I have used iOS and Android but not WP8 (yet)... I think WP8 is more advanced than iOS but still has a few things to add to catch android... competition is GOOD! The review on the 920 camera (apart from low light performance) is pretty average... I was hoping Nokia would lift the bar and force android and apple to match it... oh well. Qki, 06 Dec 20121a) come to Poland in november and leave at march, to understand a meaning of word "somet... moreBravo! you have covered and express better than I can do what I wanted to tell these diehard android faN. I sensed that in truth and reality they still remained Nokia fan but somehow they got frustrated for quite sometime and switched to android or Iphone. 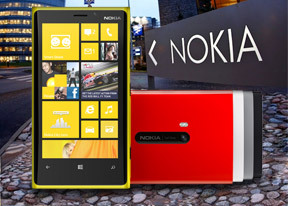 Com'on buddies let's get this Gargantuan NOKIA LUMNIA 920! I do have Samsung SIII but this would not prevent me from going back to our original beloved brand. NOKIA. i come from galaxy S2 (still great handset which i preffer somehow to S3). AnonD-83178, 06 Dec 2012Thats a very long post with so much false info that is just your own opinion. For example pock... morewhen someone pulls the note 2 from ur pocket and u stil be thinking that its in ur pocket ... lol ... imagine that situation and ur troll face when u find out ur phone is not in ur pocket. the heavy brick i can easily notice if its not in my pocket... advantage right ?? Does it still vibrate then ring? Or did they fix that so it can vibrate AND ring? i seriously dont understand why the heck in the world these S3 or note owners commenting on this post. If u r so happy with ur phone then mind ur own work why r u even bothered what devices nokia is releasing if u hate it so much. this is lumia 920 review post ...let the people who r intesrested in this phone discuss the pros and cons and share their experience. Note 12 or S3 owners why r so worried ..r u scared that this device might be better than u (bore)droid ...u r still having that love for nokia which u had used long time ago. ... what is it. if i were a s3 owner or any droid owner and if i felt that there nothing that can beat droid then i wouldn't even have bothered to chk posts on other devices or platform.i would have been a true fandroid. AnonD-44737, 06 Dec 2012using android htc sells downward to 23%. how could u tell that using android nokia will be suc... moreI donno first of why u replied to my post and second i dont understand what u r saying. ridiculous phone it is .... and u guys want pocket friendly phones hmmm ... thats what droid users wil be like .. themselves confused. AnonD-77443, 06 Dec 2012and 4) Batteries degrade over time, instead of tossing a phone that doesn't hold charge you si... moreBy the time battery degrade i would definitely want a phone which is latest in market. ..... my avg time spending with any phone is 1 to 1.5 years .... so i guess every stupid phone out in market will have battery which lasts so long. u use ur same s3 for next ten years by changing the batteries. I must say lumia 920 is next 3310 in reliability.